Little Lady Luxury: Don't rip your nails off! Don't rip your nails off! I'm kicking myself right now because I didn't get a picture of my nails after I soaked them off - which would have perfectly illustrated what you're about to read. Just thought you should know that I'm kicking myself! Anyway, today I want to show you a picture that has been going around Facebook and Pinterest a lot lately. It basically illustrates the difference between getting nails done the proper way versus getting them done the quick way - and also between soaking nails of the proper way versus prying them off. I hope everyone out there begins to understand that "false" nails don't normally do much damage to your natural nails. 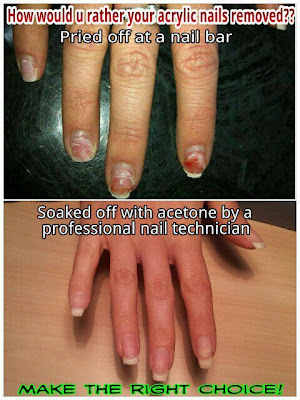 A nail tech should never use a drill on your natural nail - they should just scuff off the surface shine of your nails with either a buffing block or a fine grit nail file. Anything more than that is unnecessary. So if you see people starting to do too much work on your natural nails before applying tips - walk out. I urge you to. If done correctly and removed correctly, false/fake nails are not particularly harmful to the natural nail. ** Now let me make a quick little disclaimer about this picture. I did not make this picture, and I don't really agree with them implying that "nail bars" are bad. I wish it would just say: "DON'T RIP OFF YOUR ACRYLICS - EVER" - So in short this isn't me calling out specific techs or salons, its just to inform you that there IS a proper way to get the nails off. **Also, the super red nails are not typically what you get when you rip off nails - someone did a number on this person hands honestly. If you take a look at the pinky and ring finger fingernail, I'd say that's about standard - ripped off natural nail. **Another disclaimer - There are certain types of gel nails called "hard gels" that are impermeable - aka they can not be soaked off- they must be filed off. Don't rip these off either! **Also, I hate that they used "u" instead of "you" in the header of the photo. Grammar people, grammar. Grammar Nazi must run in the blood.